According to the article, the so-called "blue man" was apparently taking upwards of 20 ounces a day, and at one point was adding baking soda and/or salt to increase the concentration. Yes, apparently for years on end. This is WAY too much colloidal silver to be taking daily, for such long periods of time. In my opinion, this kind of reckless colloidal silver usage is the direct result of all of the colloidal silver web site operators out there claiming that it is impossible to contract argyria from "properly made colloidal silver," and that you can drink all you want and never have any side effects. But the truth is, it is strictly a matter of ingesting more mineral silver on a regular basis than the liver and kidneys can expel. If you drink more colloidal silver than your normal channels of elimination can handle, your body will store the excess silver, and, over time, will push it out to your skin, which is your third major organ of elimination. And when the sun hits it, it will "tarnish" your skin. Using colloidal silver with in MODERATION and with common sense is the key. Just like mother used to say, "All things in moderation." We all know this, almost innately. Yet for some reason when it comes to colloidal silver usage some people become absolutely obsessed with the idea that more is always better. They seem to think that if an ounce a day is helpful, then 16 or 20 ounces a day must be incredibly helpful. It amazes me, because these same people probably take a daily multi-vitamin/mineral supplement, and they have probably received significant benefit from it. Yet they wouldn't think of taking the whole bottle of vitamins and minerals every day. Common sense alone would tell you that there will be significant problems if you take such an excessive amount of vitamins on a daily basis. Yet it never occurs to them that drinking 16 to 20 ounces a day of colloidal silver for weeks, months or even years on end is excessive. Again, I believe this is because of the plethora of misleading information that can be found on the internet. One well-known colloidal silver advocate used to write that when colloidal silver doesn't work for you, the problem is not that it didn't work, but that you simply aren’t taking enough. How could he possibly know this? He advocated taking as much as 16 ounces a day or more. When I interviewed him at a health show about eight years ago, he bragged about drinking a half a gallon of colloidal silver the night before. Interestingly, after reports surfaced that his advice had caused at least two people to contract argyria, his web site disappeared from the internet. He apparently took it down. He has apparently also moved out of the country. But a number of colloidal silver vendors continue to post his articles to their web sites, advocating these unnecessary and excessively high levels of daily colloidal silver intake. I have been a long-time dedicated user of colloidal silver, ever since it helped save my wife's toes from amputation nearly 13 years ago, and helped me resolve a long-standing case of chronic fatigue syndrome that would frequently leave me debilitated for weeks and sometimes even months every year. So please don't mistake what I am saying here as being negative toward colloidal silver. What I am negative toward is misleading information about colloidal silver dosage. The bottom line is that we have to keep all of this in perspective. There are many other beneficial all-natural substances out there that can cause harm in excessive dosages, yet we don't eschew the use of these substances. We just take them in moderation and with common sense, in order to take advantage of their healing benefits. Water: What's more, DEATH is a very real side effect of the excessive usage of...water (it's called "drowning"). None of those side effects justify being afraid to use the substances mentioned. Why? Because the key phrase involved in each one is "excessive use." When used in moderation, these substances are not only benign, but helpful. When used in excess, they can cause serious health consequences. But if used in excess daily over long periods of time, the result can be argyria, or skin-staining. It is a harmless, but cosmetically unappealing condition resulting from silver particles being pushed to the skin (the body's third major organ of elimination) at which point they oxidize (or tarnish) from exposure to the sun. Out of the estimated 10 million users of colloidal silver throughout North America, only a very small handful have been naive, ignorant or ill-informed enough to take such excessive quantities over such long periods of time to result in skin-staining. It is ridiculous to blame the substance for the misuse by the person. That's kind of like saying water is terrible for you because several thousand people a year die in it due to drowning. For anyone interested in learning about safe and common sense colloidal silver usage, please visit http://www.thesilveredge.com/ and download a copy of the FREE special report titled “What's the "Safest" Daily Dosage for Colloidal Silver?” which uses the EPA’s (Environmental Protection Agency) own figures to determine how much colloidal silver is safe to take daily, based upon your weight. Just use the link in the located in the upper left-hand corner of the home page. I am a transplant recipient. I take my immuno-suppressants (immune system killer drugs) with 3 ounces of colloidal silver every morning. After 11 years I'm not even a little bit blue. I am very resistant to just about everything. This winter everybody I know got the 6 week crud except me. Micro particle collodial silver works, and it works very well. Mr. Barnes in the middle of the Mojave Desert. Ca. I have been using colloidal silver for many years and I never go anywhere without it. I carry a small bottle of it in my purse. When I start feeling sick at all I will take 2-3 ounces a day for 2-3 days and it saves me a trip to the doctors office. The other day I woke up with crusty eyes. I put three drops in each eye twice that day and by the morning my eyes were fine. I also use it as a mouth wash. My gums would bleed after I brushed my teeth. Since I have been rinsing my mouth after I brush with colloidal silver everyday they do not bleed at all. I have my own generator and make mine fresh whenever I need it. Oprah claimed they had put no makeup on him, so I wonder who did before he got to her minions. I remember the first picture I saw of him and he did look somewhat blue but not startling blue. Then on his first interview he had on short sleeved shirts. His face was powder blue and his arms and hands looked normal. This time wearing a long sleeved blue shirt before a blue background his face looked like a highly polished piece of very dark blue patent leather and when his hands were visible the appeared to be almost black. I suppose this would just be regarded as nit-picking for this piece of propaganda. Before this I thought Dr. Oz was a great doctor. I have his good book. "You on a Diet" Now I don't think I could trust him about much of anything. PS I just washed down my morning vitamins with about 4 oz. of my colloidal silver. Nope! After about six years no sign of blue. No bad colds, flu or sore throats either. thanks for the info on the ''blue man'' on the Oprah show... I've been making and using Colloidal Silver for about a year now, and am a big advocate of this product, with my family and friends. Am always trying to get more people to use it, for everything, instead of putting nasty drugs into their bodies... This show however is really going to make it hard for us out here to ''sell'' the wonderful benefits of this product. It's very frustrating, that it only takes one stupid and uninformed person to ruin it for so many.... Thanks for the heads up in your email. I've forwarded this info around to everyone I know who uses it, in hopes of deterring the negative effects that her show might convey... Unfortunately I was unable to watch it when it aired today.. I only hope that she showed both sides of the issue by having a qualified person to rebutt the ''blue man''. turns out if you add salt while making Colloidal Silver it makes silver chloride. 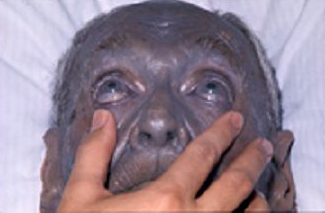 Silver Chloride is what turned his skin blue. Ask your local chemist. I don't know why this is such a mystery. There's no mystery. But to blame silver chloride solely for argyria is to miss the point. While ingesting excessive silver chloride may well increase your chances of argyria, excessive ingestion of ANY form of colloidal silver can cause argyria. Argyria is caused when the amount of silver you are ingesting (over long periods of time) exceeds the amount your body can expel through its normal channels of elimination such as liver, kidneys and sweat. All you have to do is join an online argyria support group, and ask those poor people a few questions, such as "what kind of colloidal silver were you using?" You'll find that not all of them were using silver chloride. Any form of silver, used to excess, can cause argyria. Just like any form or iron, used to excess, can cause heart disease. And any form of selenium, used to excess, can cause nervous system damage. Etc. Etc. The key is not the chemical composition of the silver, but the AMOUNT taken over long periods of time. Use it in moderation, and the body can utilize and afterwards expel it. Use it in excess, and the body's eliminatory channels get overwhelmend, and silver ends up being deposited in the tissues and organs, and later forced to the skin which is the body's third major organ of elimination. Well, eight years ago, I ingested colloidal silver more than my body could get rid of and I unhappily turned gray on my face because of it. Some people noticed it and some people didn't. Anyway, here I am knowing I have what they call Argyria. Colloidal silver has helped a lot of people keep their bacteria and virus' at bay, but is it worth the side effects of turning a different color? My bedridden mother was able to heal her bedsore with colloidal silver when absolutely nothing else seemed to work though she wasn't ingesting it, just applying it. I've had 2 treatments so far and yes it is quite painful, but so worth it. I've got my original color back before I had Argyria and I am completely thrilled. With additional laser treatments, Dr. Popkow can treat the rest of the spots that get missed here and there. I feel what Dr. Popkow charges is very reasonable. The cost is around $200 hundred a treatment. So, for the people on the west side of the United States, there is a doctor who helps with the discoloration of Argyria and for those who live even further who might want to travel to see Dr. Popkow. Today, I don't have to walk around worried about who might be wondering why my face is gray because it's not anymore. I think being ashy made me look like I wasn't well even though I felt completely fine. The embarrassment of having someone say something about the gray color of my face felt uncomfortable even though I was completely frank. I'm not a person that likes to hide, so I just went on living, but I feel the relief big time now thanks to Dr. Popkow. He has definitely changed my life for the better. The joy I feel is immeasurable. I take chlorella everyday to help chelate metals out of the body internally. The silver is not just in the skin so cleansing is very important. This is my journey and my BIG lesson and I hope that I may be of help somehow to others. i think the blue guy looks cool,he just like everyone else that has a different skin color,so people start treating him with repect. The article link below came out today (Feb 22, 2012) from Good Morning America, and talks about how there are actually people who have a RARE BLOOD DISORDER that causes them to be BORN with blue skin! It makes you wonder if certain organizations found someone who had this rare blood disorder, took a few pictures, and then paid them to say how they once had regular skin like everyone else but now it's blue because of Colloidal Silver use. Article taken from: "Fugates of Kentucky: Skin Bluer than Lake Louise"
Is Colloidal Silver a “Dangerous Scam”? A Brief Primer: What Is Colloidal Silver? Does Colloidal Silver Kill Good and Bad Bacteria?